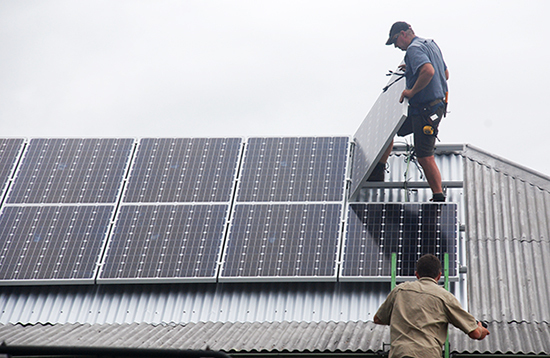 Bellbirds & Pea Shoots: Busting Our Electricity Bills - Part 5: Will Solar Pay for Itself? Busting Our Electricity Bills - Part 5: Will Solar Pay for Itself? Our roof has a new accessory. 10 gleaming solar panels adorn the west side, a little bit of eco-bling for the house. Solar Newcastle installed our 2.5kW system for $4550 last December. We have been powering along nicely over Summer and Autumn with our personal power station going at full steam. Going solar wasn't just a decision we made for the self sufficient and environnmental attributes. It had to pay for itself too, by cutting our electricity bills down the track without costing us more now. So we set out to do a little bit of maths to find out if the dollars worked out. You can use these sums to work out if solar on your roof will save you money. Take one year of electricity bills and total the cost of the bills to reach an annual electricity cost for you household. Our household of two people uses 7400kW/hrs at $3000 annually. In the previous post Busting Our Electricity Bills - Part 4: Sizing Our Solar System, you worked out how much electricity your household consumes. You used these figures to work out the best size of solar system to meet your needs. We chose a 2.5kW system which would meet approximately one third of our annual electricity needs. Using the annual percentage figure for electricity supplied by your chosen solar system size that you calculated in the previous post, apply it to your annual electricity costs to work out how much your chosen solar system will save you. How long will it take for your solar panels to pay for themselves? Get three quotes for your chosen solar system and then pick the best one. Our best quote for a 2.5kW system was for $4550. By dividing this figure by the amount saved off our electricity bills annually we will find out how long it will take to pay for itself. Cost of 2.5kW solar system / annual saving off electricity bills $990 = 4.6 yrs to pay for the system from the money saved off our electricity bills. And the great thing is that once the panels have paid for themselves, you really can enjoy free energy from the sun. A number of solar suppliers are now offering enticing finance options with up to 30 months interest free. At the time we installed our system Solar Newcastle offered us a 2 year interest free credit card, with minimum monthly repayments of approximately $130, plus a yearly fee of $100. We estimate that our 2.5kW system will save approximately $85 per month on electricity bills. So whilst the minimum repayments are a bit more than our savings on our electricity bill, it makes sense to pay off as much as possible during the interest free period. Will solar pay for itself? In our case our solar system will cost approximately an extra $500 in repayments for the system over the first year on top of the savings we make on our electricity bill. However last year we spent the same amount on buying 100% green power. In order to finance our solar system we made the decision to drop the green power component of our bill. I feel a little uneasy about buying coal power for the remainder of our electricity consumed, however with the continued increases in the cost of electricity, we felt it was unlikely we would be in a position to continue our support of green electricity if we didn't go solar. So in our case, yes, solar pays for itself!